Obamacare’s Death Panel made its first official housecall last week, when the president gave a hug to the 70-year old owner of the “Ann’s Place” family restaurant… and several hours later,she died of an apparent heart attack from the excitement. And we’re saying “apparent” because there’s still no final ruling from Chief Justice John Roberts on whether they’re called attacks or heart penalties. But either way, the poor soul has gone the way of the doornail thanks to the same chilling embrace that Barack Obama has given our economy and freedoms. And frankly, it’s surprising that more of Obama’s supporters don’t go toes up from the sheer excitement of being in His divine presence. So frequently do the faithful pass out that Obama actually jokes that “people faint all the time at my events.” Then again, maybe the jobless ones are just passing out because they haven’t been able to afford a meal in nearly four years. Just kidding – nobody really reported that. Which certainly doesn’t mean that it didn’t happen. Instead, an ennui-wracked Jay Carney said that the president “passed on (no pun intended) his feelings that the whole family is in his thoughts and prayers today.” Which is a good thing, since the “Ann’s Place” restaurant, like many small businesses, may have to be sold in order to pay Obama’s death tax and make sure that this insatiable government will continue to have enough revenue to send the president on frequent luxury vacations. But on an absolutely serious note, what killed this poor woman wasn’t Obama himself… it was her belief in his myth. Her belief in his promises. Her belief in his many lies. And those lies are surely killing our country as surely as they killed Ann – just not quite as quickly. 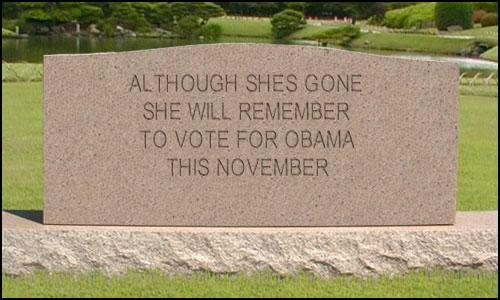 But four more years should be enough to finish the job. According to Eric Holder, burial shrouds are now an acceptable form of voter ID.